Koramangala 1st Block, Bangalore, India- 560034. I have 6+ years of sophisticated & result oriented data analytics professional possessing a proven track record of successfully applying statistical modelling, algorithm development & machine learning techniques to solve critical business problems. Highly skilled in applying advanced machine learning/mathematical algorithms such as Neural Network, Random Forests, Ensemble Models, Clustering etc. to the real world problems using Python. Looking forward to applying the acquired a gamut of skills to a challenging role in the data analytics space. I am experienced in core technical and functional in Data Science and Big Data Analytics domain, across different sectors like Banking, Retail-Marketing, Telecom, etc. I have earned an Engineering degree (Information Technology) from Techno India under W.B.U. Tech. And Currently working as a Data science professional in a data-driven customer insights application for a Retail-marketing firm. His technical and as well as functional background gives him the unique edge of blending business acumen with surgical analytical techniques. 6+ years of experienced & result oriented data analytics professional possessing a proven track record of successfully applying statistical modeling, algorithm development & machine learning techniques to solve key business problems. Highly skilled in applying advanced machine learning/statistical algorithms such as Neural Network, Random Forests, Ensemble Models, Clustering etc. to the real world problems using Python. Looking forward to applying the acquired a gamut of skills to a challenging role in the data analytics space. "He is extremely knowledgeable in Data Science - Machine Learning algorithms and Python. Also he has very strong industry experience. He is supportive & very approachable for any query or questions. " 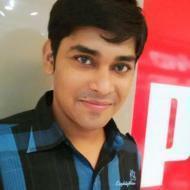 "Nilanjan is an extremely good trainer in Python and Data Science. His teaching methodology is very effective and industry-oriented. He has in-depth knowledge of AI and Data Science. " "I really enjoyed this class. I liked the in-class demos/examples to help remember the material. I would strongly recommend this instructor to any other student. " "He is the best, has deep understanding of data and made me understand the Stat,Python,ML, AI with easy ways . Thanks a lot for my transition to be a data scientist from application support role. " Nilanjan Tripathi describes himself as Trainer. He conducts classes in Big Data, Data Science and Python Training. Nilanjan is located in Koramangala 1st Block, Bangalore. Nilanjan takes Online Classes- via online medium. He has 7 years of teaching experience . Nilanjan has completed Bachelor of Technology (B.Tech.) from West Bengal University of Technology in 2012. He is well versed in Bengali, Hindi and English. Nilanjan has got 11 reviews till now with 100% positive feedback.